Adavo Workspace specialise in delivering high yield commercial property investments for both corporate and private investors. Our management team has over 20 years experience in the UK property market and has steered Adavo to be a thriving developer & operator of high quality workspace in the North East of England. 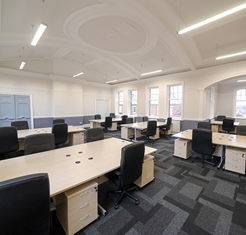 Our core product is serviced office space in grand old listed buildings that have character and presence. All aspects of the supply chain are managed in-house with integrated sourcing, renovations, lettings and facilities management. We secure finance for our purchases through private investment and joint ventures. We enjoy a growing pool of satisfied investors and are dedicated to providing the highest standards of business ethics and customer service to fully meet the needs of our exclusive client family in an ever-changing built environment. Local landmarks that are well known & loved. 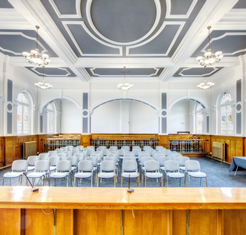 Our business model entails buying grand buildings in town centres to provide workspace for local communities. We buy old town halls, police stations, courts, libraries - buildings that are local landmarks with stature and history. They are often located within walking distance of the local town centre which means good transport links and parking. 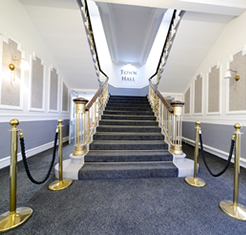 We then renovate each building to a market leading standard which creates value and give each asset a sense of prestige. We maximise the income by pursuing a multi-let strategy, letting each building on a room by room basis. Our multi-let approach allows us to be both affordable for tenants and high yield for investment. The model is low risk lending for banks and institutions, whilst representing a very safe fully managed property investment model for any clients looking for alternatives to under-performing stocks, shares, savings and pensions. A commitment to putting our customers first. Our aim is to deliver a world class customer service. We have stringent service level standards in place and a designed process that ensures all investors receive an exceptional experience from initial enquiry through to re-investment. In addition to timely responses and efficient processes, we recognise that world class customer service is also about offering market leading products at the right time in the market. At Adavo Workspace you will find both aspects are addressed. Our investments are straight forward and our buildings enjoy over 90% occupancy year round. We understand that the economic environment is constantly changing and will continue to change in the future. We offer 7.5% annualised returns within a risk managed business model but are constantly assessing the relevance of our offerings and continuously improving to achieve the best possible return for our clients, both now, and in years to come.